The biggest surprises of this year’s E3 came in form of impromptu interview opportunities that popped up during our appointments at the show. One of these happened when we stopped by Square Enix’s spacious booth for a showing of their JRPGs. Instead of the usual demo and information overload that everyone who writes about games at E3 are used to, Callum and I got a chance to sit down and chat with Tokyo RPG Factory’s Usuke Kumagai, the technical director of I Am Setsuna for about an hour, along with a handful of other writers. I Am Setsuna is the company’s first big RPG project, and thus, the task of making it one fell to Mr. Kumagai, whose previous works like Professor Layton and the Unwound Future and Professor Layton and the Last Specter are considered to be some of the best games of their generation. 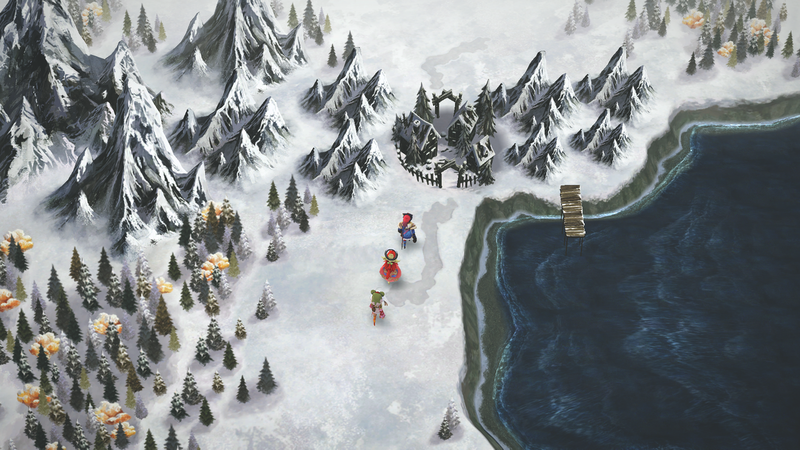 According to him, I Am Setsuna looked to the golden age of JRPGs for its themes and gameplay, with a special and warming focus on Chrono Trigger, one of Square Enix’s biggest successes and widely regarded and among the Super Nintendo’s most loved games. Those cues to 16-bit RPGs became quite apparent once the work-in-progress and partly translated demo began, showing us a little of the game’s “super deformed” character art style. It’s obviously very akin to that generation, even though it also has more modern elements, like more flowing fabric and hair, as well as a lot more detail and fluidity in animations. Mr. Kumagai went on to say that a lot of what made that era of role-playing games so memorable was how characters related to one another in more than simply taking arms in a group against a common foe, so the aim of making I Am Setsuna was to give its core character group a lot of depth, making them more than mere vessels to put stat points in. With that particular thought in mind, the conversation progressed as the group discussed what was the motivation for the story and its protagonist, Setsuna, who lends her name to the game. Mr. Kumagai expressed that the name borrows its meaning from an actual word in Japanese, せつない (the hiragana reads ‘setsunai’), which has no direct meaning in English. The best explanation is that it serves as the description of the oppressing, painful emotion that someone feels when they can’t fight their fate and the path it inexplicably takes them through life. Setsuna goes through that as she heads out along with a mercenary group, to sacrifice her life in an ancient custom that aims to appease a demonic presence that’s threatening the snowy region. Certainly a strong backdrop for an RPG. 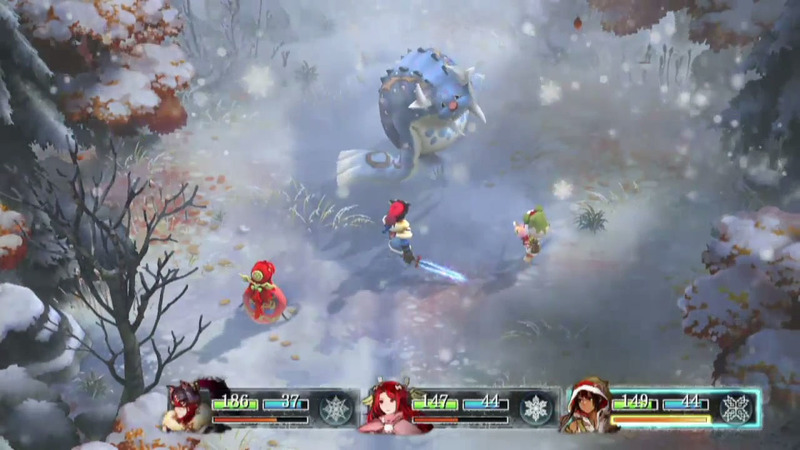 Seeing I Am Setsuna‘s gameplay in action helped set any worries aside that the game’s only pillar would be its foreboding story. Just like its presentation, its battle system is also very evocative of the past, making use of Final Fantasy’s (and the many games that followed them) Active Time Battle. It’s the classic turn-based battle system that allows characters to choose to act as soon as their meter fills up, by attacking, defending, using a skill or consuming an item. The catch is performing these action also fills up a separate meter that, once full, allows for various special moves to the performed, like boosting your party’s stats, heals, special attacks, and such. While nothing new to anyone with previous experience in JRPGs, the combat serves its purpose quite well. Mr. Kumagai closed the presentation by answering a question about the reception that I Am Setsuna is getting in Japan, where the game is already out, and what he thinks the Western audience will react to it once they get to play it. According to him, his biggest hope is that the game manages to touch players and make them interested in finishing the story not just for the sake of beating I Am Setsuna, but also to grow to understand the deep meaning that its name, its story, and, most importantly, its protagonist carry. He also hopes that the game is enough of a success to warrant more titles that approach a similar subject matter. If anything, Mr. Kumagai’s explanation made me even more interested in checking I Am Setsuna out, aside from its already intriguing and somber presentation and traditional JRPG nature, which are big pluses in my book on their own. Knowing that there’s a tale that goes beyond merely saving the world intrigued me, making the few weeks until its July release on Steam, PlayStation 4, and Vita seem gigantic. Thankfully, it’s not.